Deputy Chief Fire Officer Andy Johnson (right) hands over the keys to the new fire appliance for Much Wenlock to Watch Manager Alastair Humphries with the town’s mayor, Councillor Graham Edgcumbe Venning and his wife Christine, the mayoress. Much Wenlock welcomed its brand new fire engine at a ceremony held at the town’s fire station which will make the rural area safer during fires and major incidents. 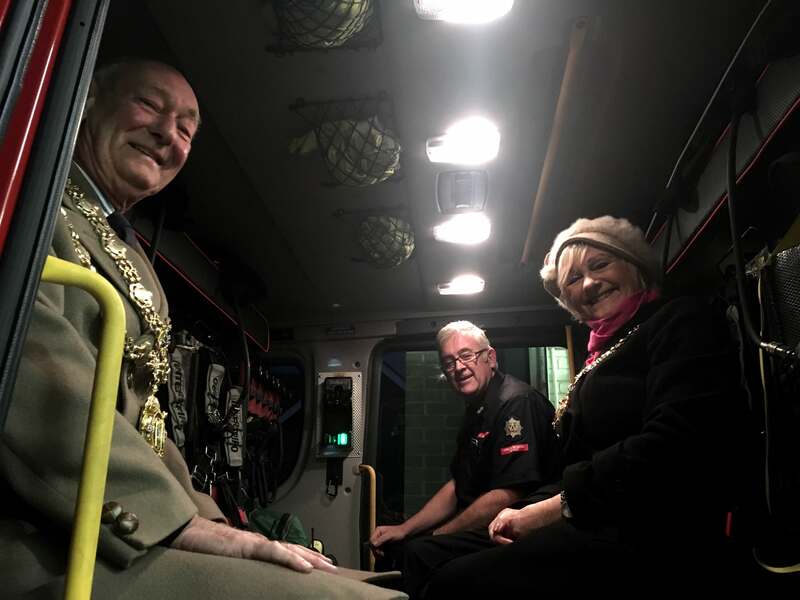 It was the weekly drill night for the town’s 11 firefighters but also in attendance were the Mayor and Mayoress of Much Wenlock, members of Much Wenlock Town Council and Shropshire’s Deputy Chief Fire Officer. Andy Johnson handed over the keys to the £225,000 Scania appliance to Watch Manager Alastair Humphries who said it would give the rural area around Much Wenlock greater resilience in an emergency. The new appliance carries 3,000 litres of water, 1,200 litres more than the 13-year-old Denis fire engine it replaces. There are longer hose reels which now extend to 80 metres instead of 60 metres for hard to reach incidents, cordless cutting equipment and a new improved thermal imaging camera to seek out hidden “hotspots” in a property fire. A lighter generator can be carried by one firefighter as opposed to four needed for the older equipment and the new appliance seats nine instead of eight firefighters. “It’s got a more powerful engine and has all round better firefighting equipment for Much Wenlock and the surrounding rural area,” said Alastair. The larger water capacity also meant that a fire could be dealt with by one fire appliance without losing precious time waiting for a second appliance. Mayor Graham Edgcumbe Venning said: “It’s fitted out to deal with just about every type of disaster or incident.